How to get there: take bus No.5 or take taxi to get to Abakh Khoja Tomb. 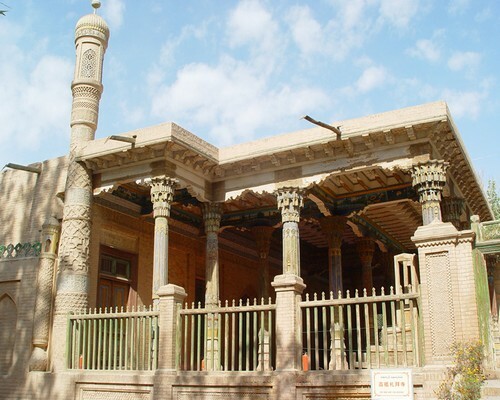 Abakh Khoja Tomb is located at Haohan Village about 5 kilometers east to Kashgar City which is a cultural relic protection unit in Xinjiang Uygur Autonomous Region. Covering an area of 2 hectares, it is a typical Islamic architecture with five generations and 72 members of the same family buried in it. 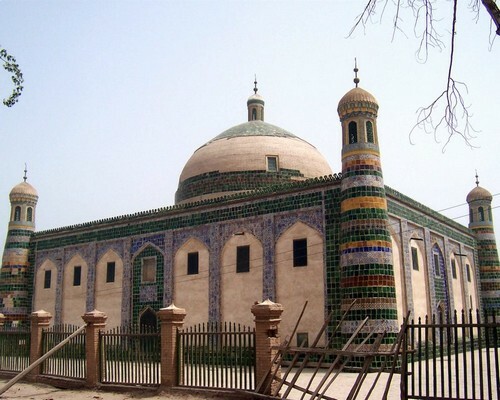 The first one to be buried in Abakh Khoja Tomb is Yusup Khoja (玉素甫霍加) who is a famous missionary of Islam. 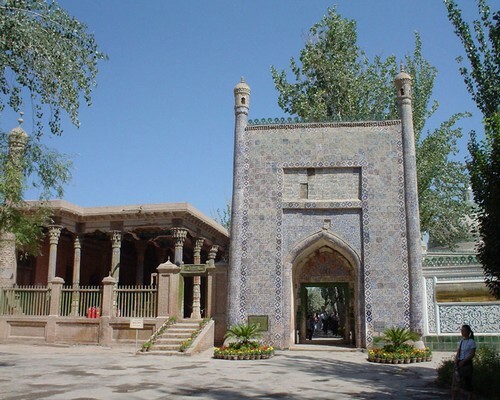 After Yusup Khoja’s death, his son Abakh Khoja (阿帕克霍加) followed his footsteps and become Islamic master of Ishan sect (依禅派) in Kashgar during the end of Ming Dynasty (1368-1644) and the beginning of Qing Dynasty (1644-1911). Because Abakh Khoja is more famous than Yusup Khoja, the tomb of Khoja family was named as Abakh Khoja Tomb in 1693 when Abakh Khoja was died and buried there. Abakh Khoja Tomb is also called Fragrant Concubine Tomb (香妃墓) for a famous concubine of Emperor Qianlong (乾隆, the fourth emperor of Qing Dynasty ruled during 1736-1795) who was said to be buried here. From the folk story of Xinjiang, the Fragrant Concubine is the descendent of Khoja family who named Maimur Azum and was born with nice smell of fragrant. She was married to Emperor Qianlong and carried the court title as Rong Fei but died of illness when she was young and be sent back to her hometown Kashgar. In fact, scholars found that Fragrant Concubine was buried in a royal tomb in Hebei Province and Emperor Qianlong just sent a vacant coffin to her family. 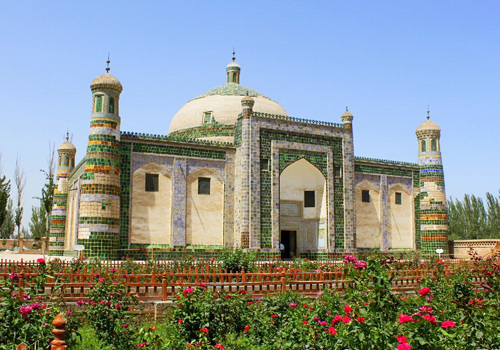 Abakh Khoja Tomb was started to be built in 1640 with the death of Yusup Khojaand. It becomes an imperial palace style tomb nowadays covering an area of 2 hectares. The whole tomb is a rectangle with walls separating the tomb with gardens outside which composed of gate tower, two mosques, lecture hall and the main tomb hall covering by green and white glazed brick on the surface. The gate tower of the front entrance was quite exquisite with tall walls and pillars surrounding covering by blue glazed brick with little white flower decorating. Small towers with round roof were built in four corners connected with the walls which use to watch the moon in order to set up the date of Muslims events. Each windows of the tower are in different geometric pattern while the tops are lotus dome with scalloped edges. Located at the western part by the west wall is the smaller mosque with color painting dome in the front hall and praying hall in the back. The larger mosque is also located at the western part with the same architecture style as the smaller one. The western part of Abakh Khoja Tomb is called Aiyitijiayi (艾依提甲衣) by local language which is an area for Muslim to do prayer in Muslims events. In the northern part of the tomb is lecture hall which is said to be used as classroom to telling the doctrine of Muslims. The main tomb hall is located at the eastern part which is about 35 meters long and 26 meters high, the round dome of which with and diameter reached 17 meters. 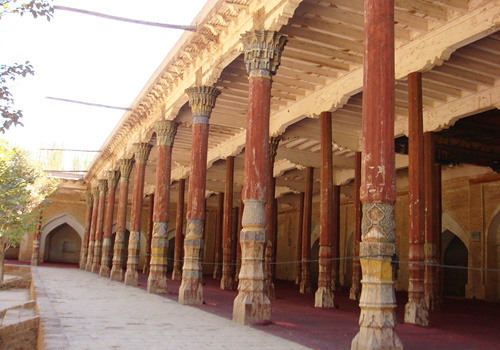 Although corridors of the architectures in Abakh Khoja Tomb are supported by distinctive colorful sculptural pillars, there is no a single pillar supported the main tomb hall. The main hall is almost covered by green glazed brick in spite of some yellow and blue glazed brick and other colorful patterns decorating. About 1 meter high platform is built in the hall which used to place about 58 tombs that covered with white background and blue flower glazed brick. 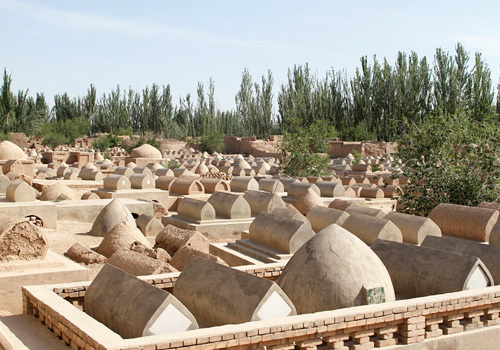 Five generations, say 72 people of Khoja family are buried here with the tomb of Fragrant Concubine on the northeast corner, with inscription of her name in Chinese and Uighur character. 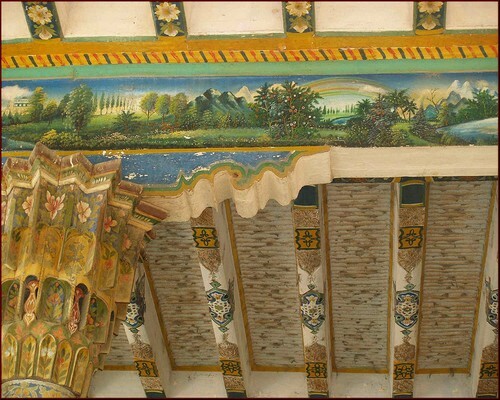 Besides blue glazed brick, there is a colorful pattern clothes covers on the tomb of Fragrant Concubine that shows respect to her. Behind the main tomb hall, there are distinctive mud and brick tomb in the backyard as well. 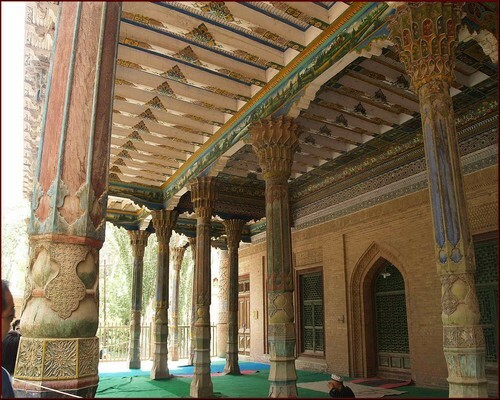 With a history of four hundred years, Abakh Khoja Tomb attracts many Muslims to do prayer, ordinary people to admire the high quality architectures and scholars to study the history of Khoja family and the Fragrant Concubine.